Unlike the hills, for a road race I reckon you want an unremarkable course – flat, minimal changes in direction, laps maybe and just enough scenery to avoid tedium. ‘Unremarkable’ because ‘boring’ is the wrong word. With nothing else to distract, you can focus on the important task of running as fast as you can and running faster than other people; a task I find engrossing. The only downside of fewer distractions is that it means fewer excuses – you are on your own. 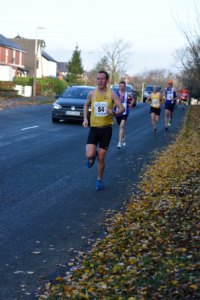 Preston Harriers found a fairly unremarkable 10 miles and, in doing so, created an awesome road race. A new distance for me this one and I wasn’t sure how to pace it. Standing on the start line all the accents were Northern and all the faces & vests were unfamiliar so there were no competitors to obviously stick with/let go. On my own indeed. The first mile was fast and the pace felt hard. By mile 4 it still felt hard but I knew I could stick with it. I went through the first lap in about 28mins – roughly my 10k pace from last weekend, though this says more about the Bellahouston course last weekend than it does about me this weekend. 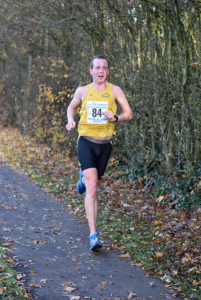 I’d been running with a Stockport Harrier for most of the way but I dropped him at mile 5.5 – a lonely place to be. I felt relaxed (too relaxed?) 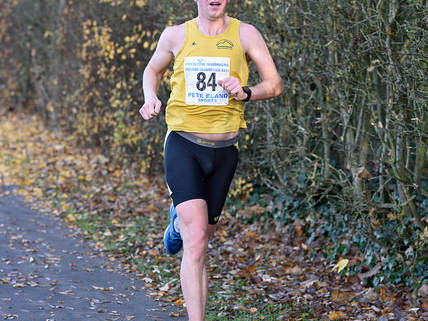 and in control for the rest of the race, though a head wind cramped my style for miles 8-10. I put in a bit of effort for the last 400M to try and crack the top-10 but couldn’t quite catch the Blackburn Harrier in front of me. My mile splits were all over the place but I think I ran it well, if a bit cautiously. Well done and good to see you found your Westies vest. But a “fun” road race, surely you jest? Different kind of fun – variety is the spice of life right? Well done young James, you seem to slipping along quite nicely this weather. Looking pretty good and in control in those action shots, James. Well done.